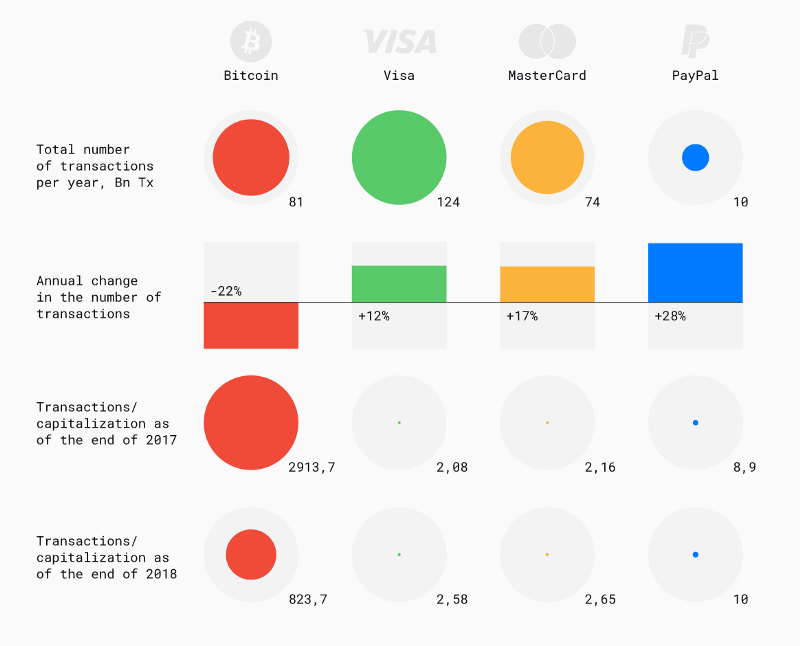 In 2018 an average Bitcoin transaction volume was 450 times higher than Visa’s average, while the total of $3.4 trillion transferred with Bitcoin in 2018 is 5,8 times higher than such of PayPal. 2018 was quite bearish for the crypto market. Many projects lost more than 90% of their capitalisation, while Bitcoin lost approximately 80% of its value. Nevertheless, the amount and volume of Bitcoin transaction are steadily increasing. DataLight experts investigated Bitcoin as a payment system and compared it with the economic indicators of Visa, MasterCard and PayPal provided in their 2018 annual reports. The results are very surprising. Let’s start with the traditional financial indicators: annual price change and yearly change in capitalisation. As we can see, classic payment systems have shown more than 10% growth, while Bitcoin’s price fell sharply. Market capitalisation change shows the same dynamics. However, Bitcoin’s capitalisation at the end of 2017 was comparable to Visa’s. In 2017, Bitcoin’s capitalisation increased almost tenfold in just half a year, climbing from $25 Bn to $240 Bn. The crypto market is more volatile than traditional market assets. Our research has confirmed that the average daily volatility of Bitcoin was more than 6% in 2018, which is almost 3 times higher than that of its competition. The key factor that characterizes the state of a payment network is its activity, calculated based on the number of transactions. The capitalization/transaction parameter allows us to analyse network activity using market evaluation. That’s where classic payment systems have much lower indicators than Bitcoin. The lower this indicator is, the higher the activity index is. Consider how identical this parameter is for Visa and MasterCard: this allows us use such a parameter as a market standard. Visa and MasterCard are veteran payment systems widely accepted worldwide. PayPal is a relatively young system (launched in 1998), but it’s not far behind: their indicators are 12 and 7 times higher, respectively. As for Bitcoin, its bandwidth capacity lags behind even in 2018. Bitcoin surpasses classic (centralized) payment systems in several parameters. In terms of total transaction volume, Bitcoin overtakes PayPal and nears MasterCard. Having taken notice of this feature, we decided to calculate the average sum of a transaction. Bitcoin is many thousands of times ahead of the competition in this aspect. Its $40000 is 450 times larger than Visa’s. This tells us that the Bitcoin’s network is more suitable for larger, probably international payments. Transcation/capitalization indicator allows us to examine the network’s activity through the prism of market evaluation. In this case, Bitcoin’s indicator is higher, which leads us to the conclusion that the market evaluates Bitcoin higher than it does Visa and Master Card, both of which have values within the 30–35 range. The next parameter that greatly influences the popularity of payment systems is the fee. When transferring sums below $100, it is more reasonable to use Visa and MasterCard, but if the sum increases, Bitcoin begins to look better. Its $0.20 fee (as of the end of 2018) is the same for all transactions, even those worth millions of dollars. In this case, the fee percentage is even lower, especially compared to classic payment systems. That is why the average transaction volume differs so much: it is more profitable to transfer large sums with a fixed rate rather than a percentage of the transferred sum. Each payment system has its own centres that allow it to process its transactions. Visa, MasterCard and PayPal have centralized data centres, whereas Bitcoin’s transactions are processed by its nodes. We compared their transactions’ quantity with the data centres of the other companies. As we see, Bitcoin is ahead of the traditional payment systems in this aspect. In 2018, the number of Bitcoin nodes remained steady at around 10000 despite a dip in its price and the increased cost of mining Bitcoin. We cannot leave aside the number of accounts — one of the main indicators that shows how widespread the network is. For Visa and MasterCard, this is the number of cards. Number of accounts/capitalization is a compound indicator, which means it is defined by the market. It allows us to see the values between which the indicator is located. The values of this indicator displayed by Visa and MasterCard are quite close, which means they are market standards. Bitcoin’s values are significantly higher due to a low number of accounts. With approximately 25 million accounts in 2018, Bitcoin loses not only to Visa and MasterCard, but also to PayPal. 2018 was a tough year for Bitcoin, as its capitalization fell five fold, the price fell from $20000 to $3000 and the number of negative media impressions increased each month. Bitcoin was introduced only in 2009. Traditional payment systems developed their companies for as many as 60 years prior to becoming industry leaders. They have developed gradually, conquering region after region, unlike Bitcoin, which became available worldwide immediately. In just 10 years, Bitcoin has managed to compete with the leaders of the payment system industry. Bitcoin’s development is occurring exponentially. If it maintains this pace, in another 10 years, it will surpass all competition. Bitcoin was the first cryptocurrency ever and its code is still imperfect. However, with all of its imperfections it is still many hundred times faster than the existing wire transfers. Bitcoin’s fees are so small that you can transfer millions of dollars for a dozen cents. This is the reason many financial organizations find it so attractive. Right now Bitcoin’s payment system is much superior to the conventional international payments and wire transfers. Technical improvement of Bitcoin’s network is almost certain to make it the world’s main payment system. This is why the bear trend of 2018 will be another dip before the exponential growth and new all time highs. At the moment, the only factor that hinders quick development of Bitcoin’s network is its upscaling problem. However, the solution for this problem — the Lightning network — is upcoming. This technology will allow Bitcoin to increase its upscaling potential and network bandwidth tenfold.